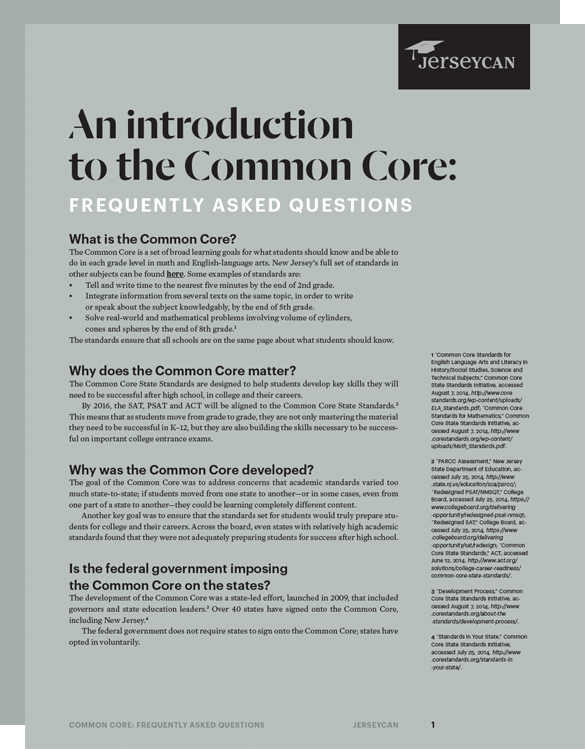 The Common Core is designed to prepare all students for college and careers. Teachers discuss how the Common Core has helped them improve their instruction. 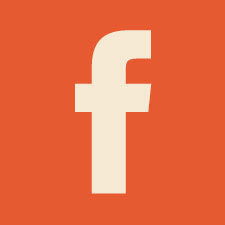 The Common Core is a set of learning goals for what students should know and be able to do in each grade level. By 2016, content from the Common Core standards in math and English will be on the SAT. The Common Core gets everyone on the same page. 40+ states and Washington, D.C. have adopted the standards: when students move in or out of the state, teachers will know what they have previously learned. The new standards outline the skills and information our students need to master in every grade from kindergarten onward to graduate ready for college or a career. New Jersey families will know how their child compares to children throughout the state and across the nation. The Common Core State Standards were designed with the post-high school world in mind. New Jersey’s previous standards were high, but even so, many New Jersey high school students graduated unprepared to succeed in college. In the fall of 2008, 70 percent of the first-time, full-time college students had to enroll in remedial reading, writing, math computation, or basic algebra courses at New Jersey’s community colleges—all without earning college credit. 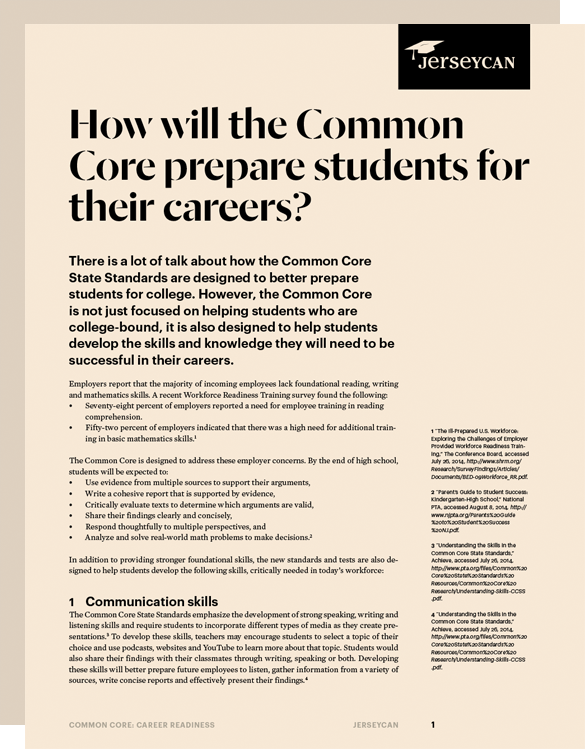 The Common Core focuses on developing the skills employers want: critical thinking, not just memorizing facts and figures. In a 2005 survey, employers estimated that 39 percent of recent high school graduates were unprepared for entry-level jobs, and 45 percent were not prepared to advance beyond those positions. Common Core-aligned instruction encourages engaged and active learning through student-led work and hands-on experiences that mirror the experiences students will encounter in college or in a career. Furthermore, the Common Core will prepare more New Jerseyans to fill the vacant science, technology, engineering and mathematics positions in the state. For every one unemployed person in New Jersey, there are 1.4 stem jobs that go unfilled. Two-thirds of New Jersey teachers are enthusiastic about the Common Core, and 67 percent believe the Common Core will help their students improve their critical thinking skills. 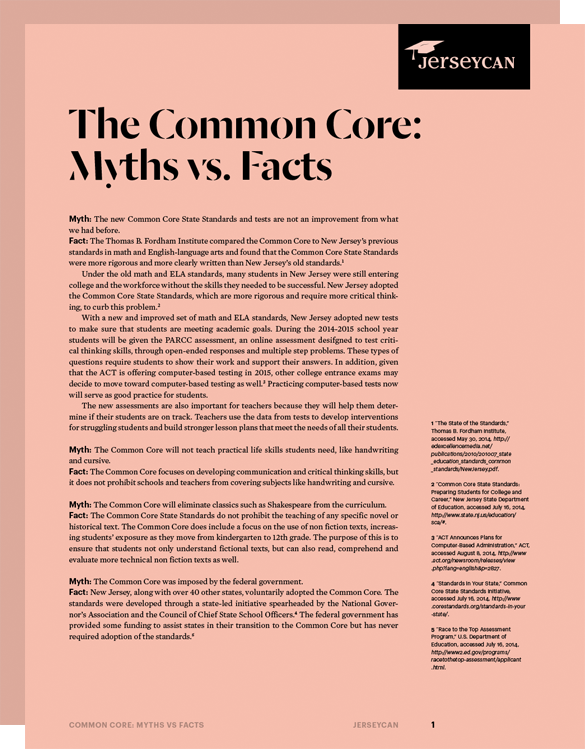 The Common Core outlines what kids should know, not what teachers should teach. Local districts retain full power over their own curricula and teachers will continue to craft their own lesson plans to meet the unique needs of their students. New Jersey set its first state standards, defining what students should know at each grade level and to assess students’ academic achievement. 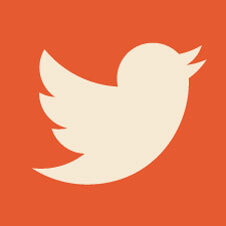 Most recently, student progress has been assessed using the NJASK in grades 3–8 and the HSPA in high school. The State Board of Education adopted the Common Core, which was developed by educators, governors and states across the country. New Jersey slowly transitioned to the Common Core, both in the classroom and on the NJASK. The NJDOE academic team has provided more than 500 presentations to over 15,000 educators on successfully shifting curriculum to the Common Core. 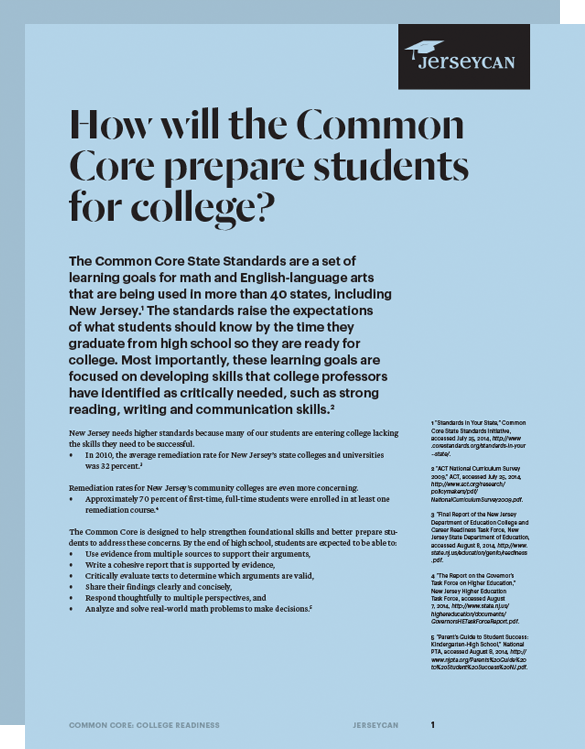 The NJDOE provided an optional Model Curriculum for both English-language arts and math in grades K–12 to guide teachers to incorporate the Common Core into the classroom. Available at www.state.nj.us/education. The NJDOE launched the New Jersey Educator Resource Exchange, a free website where New Jersey educators can access and share instructional materials. Available at www.njcore.org. Through this groundwork, we will be able to measure student outcomes in a new, meaningful way. 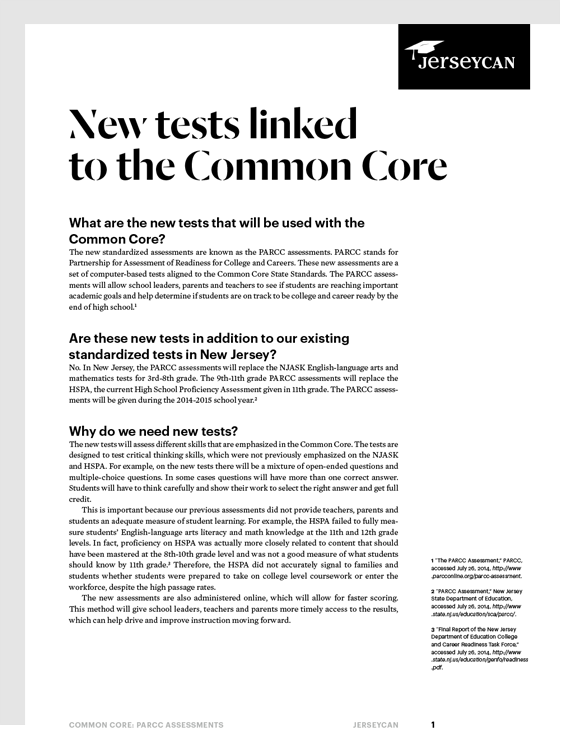 Beginning in the 2014-2015 school year, the Common Core-aligned PARCC assessments will replace the NJASK and HSPA. To prepare, 77 percent of school districts volunteered to field-test the computer-based PARCC. More information is available at www.parcconline.org. 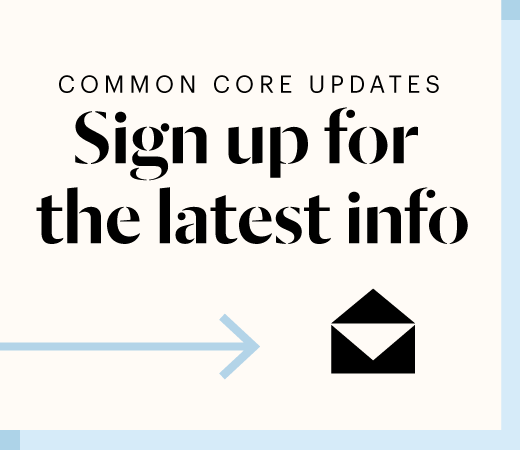 Want to learn more about the Common Core? We want to make sure that you have the information you need to understand the Common Core in New Jersey. Visit our campaign page regularly to see what's happening, and sign up for our email lists to receive updates on the latest developments. Launched in March 2013, JerseyCAN: The New Jersey Campaign for Achievement Now is a nonprofit organization that advocates for a high-quality education for all New Jersey kids, regardless of their address. We help create learning environments that best meet every child’s need by focusing our work on starting earlier, expanding choices, aiming higher, cultivating talent and reaching everyone. Because great schools change everything.